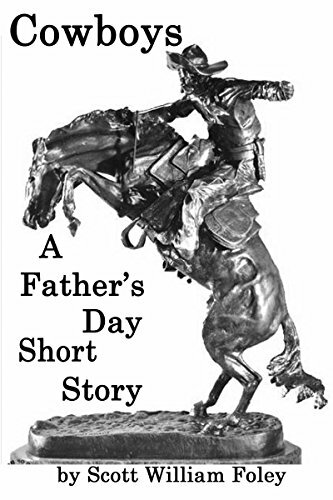 Looking for a good Father’s Day short story? Look no more! “Cowboys” is available for download on both the Nook or Kindle. Click the below links to visit! Ron Irlam sits in his den with his wife, waiting for his son to arrive for Father’s Day. But why is Ron so upset, and why does he behave so cantankerously every year even though he desperately loves his son? I’ll give you a hint: it involves cowboys. With Father’s Day rapidly approaching, I find myself reflecting on what it means to be a dad. For me, it’s hard. I’m currently thirty-six years old, and with a four year old and a thirteen-month old, I feel like I’m barely keeping it together. My wife and I are both well-educated, well-adjusted people with good jobs and stable backgrounds. But even with that being said, it’s a challenge every single day. Don’t get me wrong – I love being a dad. And what I’m about to write is going to sound very sentimental, because I’m a sentimental guy. But I don’t want the reader to think for one moment that I find being a dad easy and free of adversity. But, the truth is, I was never comfortable in my own skin until my first daughter arrived. Growing up, people always told me I’d be a great dad, and I never really understood what they meant. I get it now, because I think I’m a pretty good dad, far from perfect, of course, but I try my best. I think it’s really interesting that people saw a “dad” in me decades before I saw it in myself. I actually used to cringe when people said that, because I felt it a weakness in my personality. Now I know that it’s a strength, one that I hope to foster with each passing day. In the past, I tried to be cool. I tried to be hip. It never really worked well for me because I’m neither cool nor hip. Now I couldn’t care less if I’m either of those things because I’m too busy trying to take care of my two kids with my wife while pursuing a Master’s degree and holding down a full-time job. I’ve never been busier in my life than I am right now, and that’s okay with me. Every day I see my children gain a new achievement, and that’s an achievement for my wife and me as well. We work hard at trying to teach them and give them new experiences, we strive to help them realize right from wrong, but by no means is it a walk in the park. When I hear about young men running out on their families, I get it. I don’t accept it, and I certainly don’t condone it, but I understand it. Nothing can prepare you for being a parent. It’s a nonstop, unending, unrelenting task, especially if you’re trying to do it well. For most of us, me included, it’s overwhelming. But, in my mind, being a dad is one of the greatest responsibilities a man can take on. In my opinion, a father must always stick by and support his children. No matter how hard, no matter how much of a burden, a man must stay with his family. I’ve heard people say in the past that they had to relinquish their dreams for their children, but that’s not the case with me. I honestly feel like I hadn’t really found my true self until I became a dad. It made me a better teacher, a better student, hopefully a better husband, and definitely a better person. If anything, it’s helped me to manage my time better. I still chase those hobbies that intensely interest me. I still read, I still write. I do everything I wanted to do before they were born, but now I just do it more efficiently. Instead of procrastinating for weeks at a time and finally getting something done in one bluster of activity, now I chip away at things, a little bit every day. It helps me to feel more productive than ever. Do I get frustrated sometimes? Absolutely. Do I want to go hide behind the couch sometimes to get a few moments of peace and quiet? Yes. But I know exactly the kind of guy I’d be right now if not for my wife and kids, and I’m glad I’m not that guy. Being a dad is difficult and demanding, but it’s also the most rewarding experience of my life. I love being a dad, and that’s pretty cool. Ron Irlam sits in his den with his wife, waiting for his son to arrive for Father’s Day. But why is Ron so upset, and why does Ron behave so cantankerously every year even though he desperately loves his son? I’ll give you a hint: it involves cowboys. To discover Ron’s predicament, read “Cowboys: A Father’s Day Story” in this month’s issue of News and Views for the Young at Heart. Comments or questions are always welcome. Get in touch at scottwilliamfoley@gmail.com.